Epic Spell Wars of the Battle Wizards: Duel at Mt. Skullzfyre was the inconveniently long-titled first chapter in the war to end all wars. It was pretty awesome. The second Epic Spell Wars was way more awesomer. Now the third Epic Spell Wars game is here to make the first two look totally dumb... unless you haven't bought the first two yet, in which case they're still pretty cool. If you thought being snared in the absurdity of an eternal Wizard War where life and death carry no meaning was a hoot in the first two games, well, my friend, you'll need to bring a change of underwear this time! 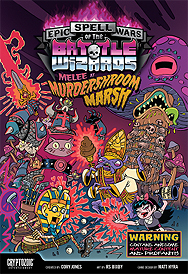 Melee at Murdershroom Marsh is a hazy, drug-induced bender battle for supremacy amongst 2-6 fellow Wizards. You'll be tripping ballz and murdering AT THE SAME TIME. We call that a win-win scenario in the Wiz Biz. You'll possess unbridled magical power to rule the intemperate battlefield as you see fit. What better way to endear yourself to friends and family than to be a giant spell-wielding d-bag for all of eternity! Stand-alone game AND 100% compatible with the previous games! 128 All-New Spell-tacular cards to wreak havoc with crazy combos! 8 New Wizards to trip out with (and brutally murder)! Expand your Spells with new gnarly Cantrips and radical Bad Trips! All Deliveries are either Creatures of dual-glyphed!